A teenager has been given a three-month suspended prison sentence for claiming a former colleague was one of James Bulger's killers. Wayne Vincent Dale, 19, of the Isle of Man, was convicted of lying about the whereabouts of Robert Thompson, who has been given a new identity. Dale sent a message on Facebook naming a former colleague as Thompson. 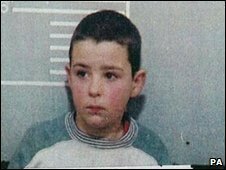 Thompson was convicted along with Jon Venables, both aged 10, of murdering toddler James on Merseyside in 1993. The three-month sentence was suspended for two years at the Deputy High Bailiff's Court, in the Isle of Man. Dale was also given a one-month sentence, suspended for two years, to run consecutively, after admitting stealing from his girlfriend while on bail. He made false accusations that one of his colleagues at a DIY store on the island was Robert Thompson. The lies were told on 30 October last year, on Facebook and face to face, police said. Officers traced the message to Dale, of Murray's Road, Douglas. He was charged with using provoking behaviour, which he admitted at a hearing earlier this month. The court heard he did not remember anything about the incidents because he was under the influence of drugs. Deputy High Bailiff Alastair Montgomery, sentencing, said that it was "difficult to imagine a more serious allegation to make towards another person". He said Dale had "put that person [the victim] at significant risk of serious harm" and in a "perilous position" by his allegations. James Bulger was abducted by Venables and Thompson when he was two, from the Strand shopping centre in Bootle. His body was found by children playing on a freight railway line more than two miles away. Venables and Thompson were given life sentences, but released in 2001 with new identities and licence conditions. Venables was recalled to prison in February for breaching his licence conditions. Insp Helen Mason, of Isle of Man police, said: "Although this happened some years ago, it is a very emotive issue and the public still feel very strongly about the circumstances of Jamie Bulger's murder. "Being wrongly named as one of the persons responsible for this has been upsetting for the victim but he now just wants to get on with his life." She added: "This case also highlights the more unsavoury use of social networking sites."